The EPA gives some good suggestions and guidelines for getting rid of bed bugs, but even they admit that “Getting a pest management professional (PMP) involved as soon as possible, rather than taking time to try to treat the problem yourself, can help prevent the infestation from spreading.” Our own team strongly suggests contacting a pest management professional for bed bug treatment. Even in that, there are many pest management companies and many treatment methods to consider. Chemicals treatments are poisonous. They rely on harmful toxins for remediation. This is problematic, as even the Environmental Protection Agency recognizes the following side effects of pesticide exposure: skin and eye irritation, nerve damage, disruption of the endocrine system and even cancers. Chemicals also find their way into the ground, air and water, posing a serious environmental threat. According to the American Association of Poison Control Centers (AAPCC), pesticides were the 9th leading cause of exposure in humans. So ask yourself, do you want your family, friends or guests exposed to these poisons? Heat treatment, on the other hand, is non-toxic. Heat treatment is safe for humans, pets and the environment alike. Many chemical treatments can take up to 3 applications to achieve the same effects as 1 heat treatment. Also, many pesticides do not kill bed bug eggs and larvae, requiring additional visits every 14 days or so as new eggs hatch. Imagine waiting 6 weeks before turning the corner on a bed bug infestation! This can be a nightmare for a homeowner. For the hotelier, this means many days of rooms without guests, dramatically affecting their bottom line. 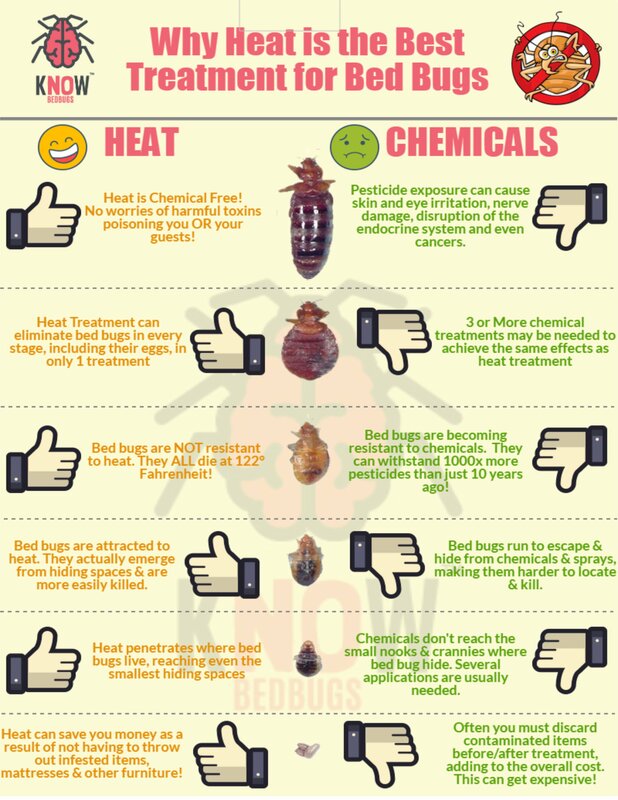 Heat treatment can eliminate bed bugs in every stage, including their eggs, in only 1 application. Homeowners can return to your usual routine THE SAME DAY! Hoteliers can also return the room to service THE SAME DAY, saving dollars in the process. Chemical treatments MAY NOT EVEN KILL BED BUGS! Years of pesticide use has made bed bugs incredibly resistant to chemical treatments. Recent research has shown that some bed bugs can survive more than 1,000 times the amount of pesticide considered lethal just 10 years ago. According to this 2016 article from Natural News, which cites several studies, bed bugs are developing thicker exoskeletons, more robust nervous systems, and stronger detoxifying enzymes. These adaptations are rendering commonly used pesticides useless. Bed bugs, however, offer NO RESISTANCE to heat treatments. They can’t survive temperatures above 122°F. Most heat treatments raise the temperature to at least 130°F, more than enough to kill bed bugs. Chemical treatments do not reach every hiding place. This is yet another reason that most chemical treatments require several applications. Bed bugs move into the smallest of areas (electrical sockets, curtain rods, baseboards and small holes in the walls, floor or ceiling) to escape chemical treatments. They can remain in hiding, without a blood meal, for up to a year OR EVEN LONGER! What looks like a new infestation could very well be the same infestation that you thought was eradicated. Bed bugs are attracted to heat, however, and actually emerge from hiding spaces making them easier to kill. Heat also penetrates those small places that chemical sprays and foggers simply can’t. Furniture and other items sometimes need to be discarded before or after chemical treatments. Who wants to sleep on a mattress contaminated FIRST by bed bugs and THEN by chemicals? Neither you NOR your guests! Replacing those items adds to the overall treatment cost, and can get quite expensive. Treating with heat is much easier, requiring very little preparation on your part. Every item in the room/home can effectively be treated with heat, removing the need for disposal and costly replacements. Of course, no matter the treatment method, mattresses stained with bed bug excrement should be replaced. This is especially true for the hotelier. Of course, the absolute best method of bed bug remediation is to never get them in the first place. Yes, prevention is key. Knowing what to look for (and thereby what to AVOID) is crucial. You can use our free bed bug detection list to help you identify the common signs of a bed bug infestation (bed bug feces & bed bug shells), including answers to “what do bed bug eggs look like” or “what do bed bug bites look like”. Second, as a previous blog explains, cooperation is needed between hotels and their guests. Hotels are NOT the source of the problem. It is up to every hotel/motel guest to perform their own bed bug inspection prior to unpacking. When you travel, use our free inspection checklist to do just that. If you do find evidence of a bed bug problem, notify the hotel immediately. They will be grateful you did! Prior to making your reservation, ask your hotel if they are a member of KnowBedBugs.com. If you own or manage a hotel or resort property, contact us to get your staff trained & tested and to get your hotel certified. We are working with hotels on detection, prevention and guest interaction, all in an effort to keep your property bed bug-free, and to stay off of the bed bug registry. At KnowBedBugs.com we train hotel staff (housekeeping, front desk & maintenance) on the identification of bed bugs AND in dealing with their guests should an event occur. After training, each employee is tested. Finally, the hotel is awarded a certification based on the percentage of full-time staff that has trained and passed the testing. Our certifications range from Bronze to Platinum. We are working with hotels to get out in front of the issue, and understand that it takes cooperation between the hotels and their guests. We are starting the conversation.